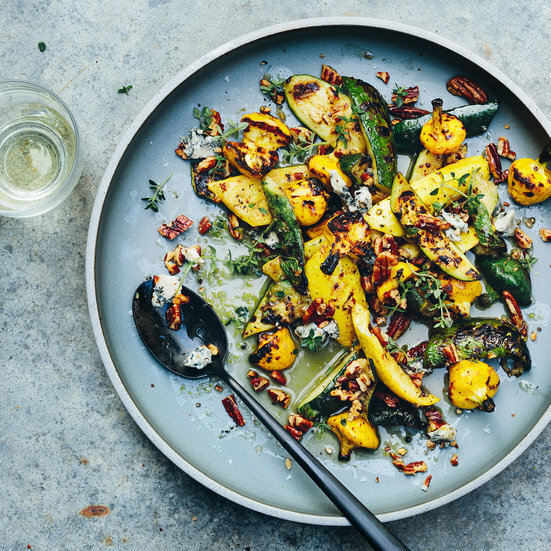 A delicious recipe with a combination of summer squash, blue cheese and pecans, makes the perfect salad for summer entertaining. Quarter the zucchini and summer squash lengthwise and cut off the soft, seedy ?centers. Cut any large pattypans in half lengthwise—?you'll want all of the pieces to be roughly the same size. ?In a large bowl, toss all of the squash with 2 tablespoons ?of the olive oil and season with salt and pepper. Thread the pattypan squash onto metal skewers for easy grilling. Light a grill. Grill all of the squash over moderately high heat, turning once, until lightly charred and tender, about ?10 minutes. Cut the zucchini and summer squash into 2-inch lengths; transfer to a large bowl. Remove the pattypans from ?the skewers and add to the bowl. In a small bowl, whisk the lemon zest and juice with the honey, thyme and the remaining 2 tablespoons of olive oil; ?season with salt and pepper. Add the lemon vinaigrette ?to the grilled squash and toss. Transfer to a serving bowl ?and top with the crumbled blue cheese and toasted pecans. Serve with grilled bread.